Those words are from a real man in real life. Those words are from Bobby Valentine after Sunday night’s game. I’m in a surprisingly good mood for a Monday in which the Yankees lost two of three to the Red Sox in the Bronx. Why? But the only thing keeping my mood from being as good as it could possibly be is knowing that Bobby Valentine went to bed last night and woke up today with a smug grin on his face after his team won an extra-inning game at the Stadium following his ejection. If you don’t think he has a smug grin on his face today then you didn’t watch the game last night. If you need a recap of the game just re-read the above quote. There’s a 100-percent chance that Bobby thinks his antics following a botched, but difficult hit-by-pitch call was the reason for his team’s win rather than David Robertson walking Jarrod Saltalamacchia to lead off the 10th and then giving up two singles. It was Bobby Valentine’s charisma and geniusness (no, that’s not a real word) that led to Will Middlebrook’s line-drive single and Pedro Ciriaco’s bloop to right field. Orel Hershiser even said, “This is a way to get his team inspired.” Once again, the Red Sox are 51-51. It was all Bobby Valentine. Well, maybe not all Bobby Valentine. The Red Sox might have also won because of Josh Beckett even though he didn’t throw a pitch. Beckett joined Valentine in berating the umpires for a call that would have been hard for any home plate umpire to make, let alone one that was on the ground in pain because Middlebrooks couldn’t get a bunt down properly or pull his bat back in time. Bobby and Beckett (potential children’s book title?) weren’t the only ones putting on a show for the the only .500 team to still regularly participate in nationally televised games. There was Adrian Gonzalez chirping the umpires from the dugout as he apparently found someone other than God and the nationally televised schedule to blame the Red Sox’ problems on. It shouldn’t bother me that right now Bobby Valentine is somewhere smiling and maybe building a fence or a deck, thinking that he willed the Red Sox to a win. It bothers me a little less when I remember that despite losing two of three at home to the Red Sox, the Yankees still lead the East by 7 1/2 games and lead the Red Sox by 9 1/2 games. I decided to go to the diary format that I used for the first part of the Subway Series back in June for this past weekend. Just pretend like you’re reading this in one of those black-and-white Mead composition notebooks. We’ll never know what would have happened if Mark Teixeira didn’t beat out that potential inning-ending double play in the first, which turned a scoreless inning for the Yankees into a three-run first. But let’s not pretend like Aaron Cook would have shut the Yankees out for the rest of the game. There are pitchers that “pitch to contact” and then there’s Aaron Cook. Cook has thrown 40 innings for the Red Sox in seven starts. He has only walked four hitters, but he’s also only struck out four hitters. That might be a way to navigate through a lineup like Seattle, which he did on June 29 with a complete-game shutout, but when you’re trying to go through the Yankees lineup without an out pitch at Yankee Stadium you’re going to be back in the clubhouse early setting up the beer pong table with Josh Beckett. Phil Hughes allowed three runs, but it should come as no surprise that the three runs came on three solo home runs. Hughes leads the league with 25 home runs allowed, and has matched his total from 2010 despite nine less starts and 55 fewer innings pitched, and he still has 12 or 13 starts left this year. I’m not sure if Hughes is going to get a postseason start this year, but if he does, it can’t be at Yankee Stadium. Even though he’s 7-3, 3.93 at home and 3-5, 4.27 on the road, Hughes has given up 17 home runs in 68 2/3 innings at home. Thank you, Mark Melancon. That’s all. Every once in a while CC Sabathia has these starts where he can’t get it together and you get the feeling that every pitch is going to end up falling in somewhere. For some reason these starts seem to frequently come against the Red Sox. Sabathia did a terrible job in his previous by allowing back-to-back home runs to the immortal Brandon Inge and Kurt Suzuki (who always hits CC well) and let the A’s back in a game they would come all the way back to win. There’s nothing really more to say other than chalk it up as another bad start for CC against the Red Sox, and I’m sure he’ll bounce back and cruise through the Mariners lineup this weekend. Guess what Jon Lester’s line was on Saturday. I’m not sure there are any Vicente Padilla fans out there. Not one. And I’m only talking about him from his on-the-field antics, which include starting multiple bench-clearing brawls and frequent head hunting. I have yet to find a redeeming quality from Padilla other than he usually blows up in a big spot against the Yankees. Padilla’s nemesis, Mark Teixeira, got the best of their battle on July 6 at Fenway with a two-run triple for which I awarded Teixeira 25 games of “Ladies and gentlemen” immunity. On Saturday night Teixeira tagged him for a game-tying, two-run home run and earned himself an additional 15 games of “Ladies and gentlemen” immunity. 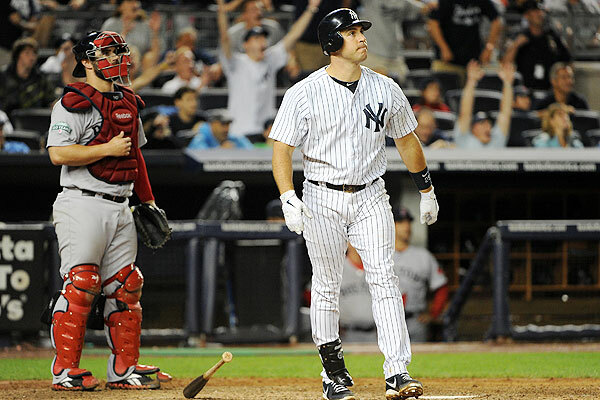 After hitting his mammoth blast deep into seats, Teixeira moved slower out of the box and down the first-base line than Jorge Posada ever did trying to break up a double play. If I’m Joe Girardi, the next time Padilla enters a game against the Red Sox, I would make sure my guys are on the top step, and I would tell Mike Harkey to have the bullpen door unlocked and ready to swing open. As for Curtis Granderson … a bad time to make a bad read. I can’t remember not being upset about losses to the Red Sox the way I was on Saturday and Sunday night. But if you want to win games in extra innings, you can’t walk Jarrod Saltalamacchia, a .233 hitter with a .285 on-base percentage entering the game, to begin the 10th inning. You also might want to score more than two runs on seven hits and five walks. Just some advice for next time. Hiroki Kuroda redeemed himself after that horrendous Fourth of July weekend start against the Red Sox that he made me sit through at Fenway Park. Kuroda lowered his ERA to 3.28 and now 11 of his 21 starts have consisted of at least seven innings and two earned runs or less. I had put the “Coin Flip” nickname on temporary hold, but I think the name is gone forever. In fact, I’m willing to forget that I ever created it in the first place. For a moment during the Sunday Night Baseball broadcast, Terry Francona had nothing insightful to add to the broadcast so he went to the recycling bin for the overused conversation starter of “The new Yankee Stadium isn’t the old Yankee Stadium.” Thanks for the observation, Terry. Is the “new” anything the same as the “old” anything? Everyone misses the Stadium from the other side of River Ave., but it’s gone and there’s a public park in its place now. The almost four-year-old Yankee Stadium is now Yankee Stadium, and no amount of conversations about it not living up to the old place are going to bring the old one back. Francona complained about the atmosphere at the new Stadium and Orel Hershiser chimed in about the fans not getting as loud as they used to in the old one especially for a Yankees-Red Sox game like Sunday night. I would put my level of caring about the outcome of Yankees-Red Sox games up against anyone not playing in the games, and if I’m here saying that I wasn’t that upset with the outcomes on Saturday and Sunday night then I’m not going to expect the Stadium crowd to be that distraught about the Yankees’ AL East lead falling to 7 1/2 games and their lead over the Red Sox falling to 9 1/2. The Red Sox haven’t won a postseason game since the new Stadium opened and the one time they came to the Stadium for a meaningful late-season series was in August 2009. The Yankees swept that four-game series and in the series finale on Sunday night, Johnny Damon and Mark Teixeira went back to back off Daniel Bard and I heard the Stadium as loud the old place would get for a regular-season game. The new place gets loud when it needs to (the way it did for A-Rod’s two-home run off Joe Nathan in Game 2 of the 2009 ALDS, and Teixeira’s walk-off homer in that same game), but it’s hard to keep getting excited about playing a last-place team.